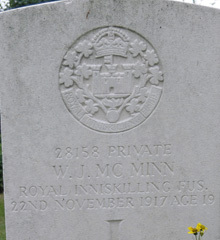 William James McMinn was a son of John and Mary Jane McMinn of Coalisland, County Tyrone. He was born in the parish of Derryloran, Cookstown. He was living in Motherwell and enlisted in Hamilton, Scotland with the 1st Battalion Royal Inniskilling Fusiliers some time in late 1916. 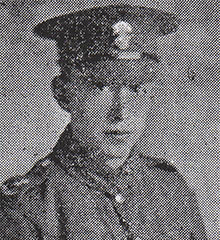 William was wounded at the Battle of Cambrai and removed to hospital and later died of his wounds.